Based on a true story, Katherine writes of a college student who carries guilt from a tragedy she feels she could have prevented. Can she overcome the shadows that haunt her? 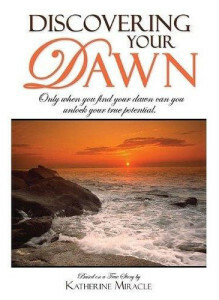 A story of love, friendship, tragedy, hope and forgiveness that helps you ask the question: Have you discovered your dawn? Are you ready to bring to light the mistakes of your past in order to help you find your purpose and unlock your true potential? Click on the Amazon Logo to purchase today!